This isn’t any big surprise or anything, but it’s still sort of breathtaking when you see it in such stark terms. 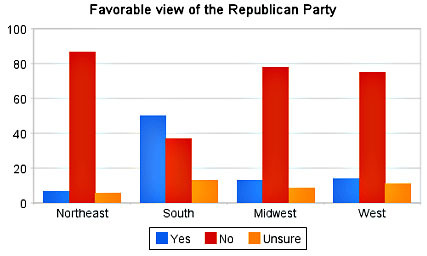 Via Steve Benen (from a Research 2000 poll), the Republican Party is just flat dead everywhere outside the South. Even folks in the Midwest can’t stand them. The GOP is, for the time being anyway, a purely regional party. And who’s responsible for that? “I know this probably sounds arrogant to say,” George Bush told speechwriter Matt Latimer in a conversation last year, “but I redefined the Republican Party.” I’d say he had a point.